Country of origin Lanarkshire, Clyde Valley in Scotland . Developed in Scotland to meet the demands of the industrial revolution. Colour Preferably bay or brown usually with a white face and white legs. Conformation Head looks intelligent and is carried high, forehead and muzzle broad and the profile of the face is straight. The legs hang straight from the shoulder to the fetlock joint. The forelegs are well under the shoulders and the hindlegs are similar with the points of the hock turned inwards rather than outwards, the legs have feathers. The Clydesdale has very active paces. Country of origin Donkeys originated in North Africa before spreading throughout Europe, and were brought to England by the Romans. Conformation There are very many different breeds of donkey, some now extinct, and many others endangered. They vary in size from the large 15hh Andalucian from Spain, to the small miniature Mediterranean breed about 8hh. The British Donkey is usually around 10-12hh. The Donkey Breed Society was formed 40 years ago and today is still helping and advising on donkey welfare and training. There is a driving section which promotes the driving and working of donkeys. Donkeys are easy to train and eager to please, so correctly harnessed and well driven they are a pleasure to own. They are very versatile, and will plough, harrow, mow grass, and pull timber. A donkey who works is much happier and fitter than one just kept solely as a pasture ornament. It is a myth that donkeys are stubborn. The donkey has a great sense of self preservation and his first reaction to anything he considers a danger is to freeze and assess the situation, while the horse’s first reaction is flight. To train a donkey you need patience, an understanding of the donkey’s mind and an ability to negotiate! Today you will see well turned out, correctly driven and willing donkeys. Country of origin Origins go back to the trotting horse and has Arab and Thoroughbred blood. Conformation The Hackney has a small convex head, small muzzle, large eyes and small ears. He has a longish thickset neck with powerful shoulders, and low withers. His legs are short with powerful hocks. The tail is well set on and carried high. At rest the Hackney stands firm and fore square, the forelegs straight and the hind legs well back. He gives a general impression of alertness. The Hackney has a high stepping action, is full of courage and stamina. Hackney may be derived from the French word ‘Haquenee’ meaning Horse for Hire. That is how the ancestors of this high stepping horse used to work, harnessed to light vehicles they used to be available for hire in London as Taxis are today. Country of origin La Perche-Normandy in France . Conformation The Percheron is wide across the eyes, with a short compact and strong body, his shoulders are deep. He has a strong short back, but yet his neck is quite long. His legs are short with strong big knees and broad hocks. The Percheron has Arab blood tracing back to the 18 th Century. He was used for farming and known for his hard blue feet which enable him to stand up to work on the roads. His action is straight and bold with long free strides. He is hardy and versatile. Country of origin Britain – Midlands – Derby shire , Lincoln shire , Leicester shire and Stafford shire . Colour Black, bay, brown and grey. Roan is not acceptable. Conformation Roman nose is a common sight among the shire breed, the neck is long and slightly arched but well set on the shoulders. Wide feet and feathers. Usually a pair are able to pull a load of 5 tons, as they are often quick to mature they are worked from about the age of 3 years old. 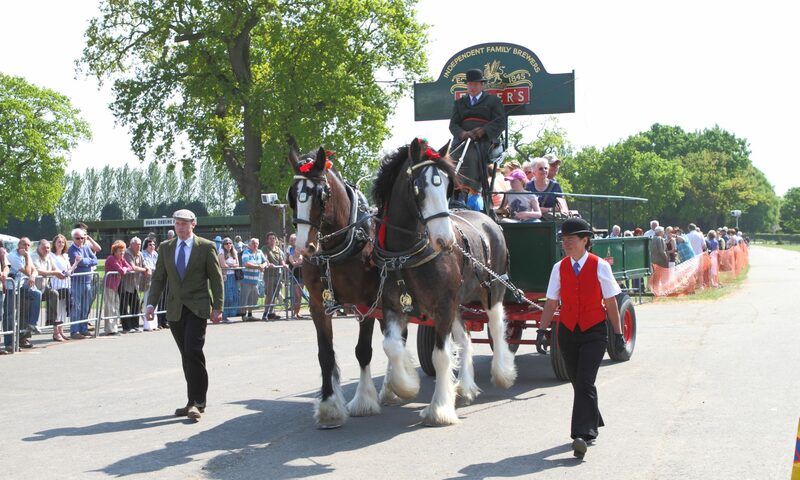 The Shire Horse once provided the motive power for agriculture, played a major role in Britains Industrial Revolution and was the major driving power in road haulage. Some say that the Shire descended from the horses William the Conqueror brought to England , more certainly they are probably descended from the old English black horses of the middle ages which knights rode into battle. There was a time in the late 1950’s early 1960’s when extinction looked a real possibility. Now the demand for Shires, both at home and abroad, is hard to meet. Societies have been set up in Germany , France , Holland and Sweden and there are many breeders in America , Australia , Canada and New Zealand. Country of origin Uncertain but there is evidence in the Shetland Isles as early as about 500 BC. Height Registered stock must not exceed 40 ins. at 3 years old and 42 ins. at 4 years old and over. Colour Black is the foundation colour but bay, brown, chestnut, grey and multi-colour are all acceptable. Conformation The Shetland pony has a well shaped head with a broad forehead, his neck rises off a well-laid oblique shoulder. The body is thickset and deep ribbed, with a short strong back, broad chest and quarters. The forelegs are well placed under the shoulder and chest with strong knees and good flat bone. The hind thighs are strong and muscular with broad hocks. The Shetland Ponies history goes back a long way. In the 1950’s excavations were carried out on a Bronze Age settlement at Jarlshof in Shetland and a pony was found dating back to the 6 th century, the bone was similar to that of the Shetland pony we know today. It is one of the purest breeds as there are problems transporting stock to such an isolated island. Shetland Ponies were used as pit ponies in 1842 after an Act was passed making it illegal for women and children to work down the mine. In 1913 seventy three thousand ponies worked down the British mines, in 1982 there were one hundred and one. The Shetland is a naturally hardy, long-lived and robust pony, mostly used nowadays for children and companion ponies, although they are good at harness work and speed competitions. Country of origin Suffolk in England . Colour Chestnut, a little white star or white on the face is acceptable. Conformation The Suffolk has great width in front and in the hindquarters. His head is big and the shoulders long and muscular. He is deep in body and round ribbed from the shoulder to flank. His legs are short, straight and have sloping pasterns. The knees are big and the hocks are long and clean on short cannon bones. Known as the Suffolk Punch it is the only clean-legged British Draught horse. The Suffolk once existed in many thousands but due to the drive for food production during the Second World War, declined in numbers and in 1966 only nine foals were born, and the breed was in danger of becoming extinct. Since then the Suffolk Horse Society have worked hard to prevent such a disaster happening. In the last few years there have been an increase in the number of Suffolk horses broken to work so not only the animals themselves are being saved but likewise the techniques and skills of working them. A feature of the breed is that every specimen now in existence traces its descent in direct male line in an unbroken chain to a horse called “Crisps Horse of Ufford” foaled in 1760. The Suffolk is the rarest breed of heavy horse. Welsh Mountain Pony Section A. Welsh Riding Pony Section B.
Welsh Pony of Cob Type Section C. Welsh Cob Section D. Welsh Part Bred. Country of origin Wales . With a stud book that started in 1901. Conformation The “Welsh” are native ponies and should be hardy and spirited. Having a bold eye set in a pony head with neat well set ears, a good length of rein with a neck that is carried well and which, in the case of stallions may be cresty. Their bodies and legs must be both strong and agile and their action quick, free and well away in front with hocks well flexed imparting powerful leverage. The Welsh breeds of today, descended from the working ponies of the past, are probably the most versatile of the World’s breeds covering as they do everything from the toddler’s pony through to the mighty event horse. Many people have them through their lives, learning to ride on a Welsh Mountain pony and in later life hunting, driving and showing the larger breeds. They are beautiful and hardy, which tributes they pass on from generation to generation and also into any part bred offspring. They have made an enormous contribution to the driving fraternity for competition, showing or just as the pony one drives for every day pleasure.